You are here: Home » Interfaith Marriage, Islamic Answers 2013, Premarital relationship, Want to Get Married, Zinaa » Can a Muslim man marry Christian woman? Can a Muslim man marry Christian woman? I am in love with a christian girl. We got in a relationship for a year and I was not a practicing Muslim and committed zina. A couple months ago. I started to really think about it and always questioned myself about this because I was really starting to fall in love with her. and me having this filthy relationship was starting to bother me. I wanted to give her something pure so I left her. I pray five times a day and read Quran daily now. I see her occasionally and we still have feelings for each other. She wants to marry me and I want to marry her also, but the problem is that she does not want to convert. We are a little older then 20 (can't mention exact age sorry!). Can I marry her like this? I was thinking that I can wait and show her, let her get used to the new, more mature me and later on down the road ask her again to convert...I don't know. I am confused and I love her. Muslim men are NOT prohibited from marrying Christian and Jewish women. It is allowed. However, such relationships are often fraught with interfaith complications, so I would suggest evaluating all your reasons for wanting to marry her besides the fact that you committed zina together (that in itself shouldn't be reason to get married). If that is the only basis you are choosing marriage upon, there's always the option of breaking up and moving on with life in a state of repentance. In any case, don't make a decision with the idea that you expect her to convert. She may eventually, or she may not. You have to be willing to accept her as she is now, and believe that who she is will still make a good wife for you regardless of her beliefs. There is a queue of 90 posts which is why it's taking long. We will certainly publish your post on it's turn iA. Assalamualaikum brother Muhammad, it's like almost everyday I come to visit this website just to see if my question has been posted. Can you please take a look at mine and when will it be precisely published? From the look of it, I would give it another two weeks or so in shaa Allah. Layla, we do not have a post submitted by you under this username and email. Maybe you registered with a different name? Wael, It's on the third page of pending posts, dated 6/29. It will all be rosy until kids are involved. You may want to raise the kids as muslims and if she does not comply then there is no hope for the kids. In early years mothers have the most influence on the kids. I have seen this happen so many times. If you do decide to get married, first ask her if she is interested in knowing more of the true Islam (not the Islam in media). You must avoid the pitfall of trying to pressure her into Islam rather let her make the choice on her own. And while you are learning about Islam, the you must also suppress your desire to impose what you have learned on her. As a thumb rule, if you only see others faults and shortcomings regarding to practice of Islam but not your own then you need to gain more knowledge and understanding of Islam. May Allah guide both of you to the right path and ease your struggles. Jasakillah Khoir sister Amy, I'll be waiting for it. I couldn't help read your message and think about my relationship.Same situation I went through we split up because of the same issue that is me being a christian and he being a muslim. we were together for about 2 years before the break and we loved each other dearly. Now i come from a strict christian family so when he asked if i would convert i refused and on the other hand i would never ask him to convert to my religion because i believe if u convert for someone and not because u truly believe in the religion is the worst sin. so we decided to separate now than later because the more we were together the more attached we got. we tried our best not to keep in touch to the extent to which i left the country for a month on a project for work. i missed him every single day but it had to be done to spare us future pain. i believe God has his own plans.after almost 3 months apart my boyfriend came outside the hotel where i was staying while i was on a business trip.He missed me as well i guess and found out from mutual friends as to where i was and just turned up without warning. anyway we are back together and now its been a year from the incident. my parents know about him n so does his we are not married yet because we are still concentrating on our careers but we are still very happy together. 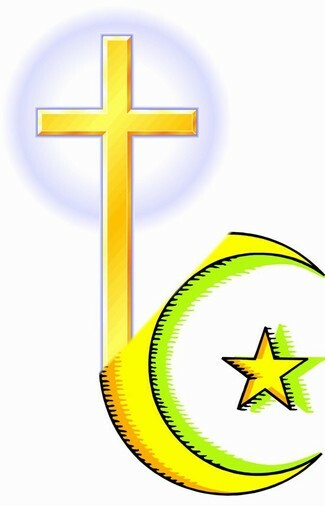 he asked me to learn about Islam for the sake of our future children and i am that's how i came across ur question.im still not willing to convert,however, i find a lot of similarities between Christianity n Islam.I have learnt a great deal regarding ur faith and have a lot of respect for the Islamic teachings. what im trying to say is if she really loves u she will be willing to try at least. if u love her just talk n be transparent ask her if you'll do get married what faith will ur children follow.what you want her to follow and before u try teaching her regarding Islam know something regarding Christianity at least she will feel u respect her feelings as well. i cant tell u for certain it will work but i believe in the Almighty if me and my love are meant to be together we will if not then im sure God has something else planned as well. you should believe the same. God guide you in ur decision. I have a question. I understand that Muslim men can marry Christian women. But there seems to be a stipulation and hope that the Christian will convert. The success of the marriage almost seems based on this hopeful outcome. Is this a requirement or just a hope? It seems to me that a successfully married person would be the one who understands that the person they married is who they are, and who accepts them as they are. We cannot and should not try to change someone. Christine, from a religious perspective there is no stipulation or expectation that the Christian wife will become Muslim. However, I think that a lot of Muslim men do have that hope. The idea of accepting someone as they are and not trying to change them sounds nice, but then there's the issue of the children. In what religion will they be raised? Of course you are right, we cannot marry someone hoping they will change. It doesn't work that way. Personally I feel it's best for a Muslim to marry a Muslim. There is a difference of opinion among the scholars about such marriages between a Muslim man and a woman from the people of the book. Most scholars say you can many a chaste Christian woman even if she commits shirk (trinitarian). Other scholars say a Muslim man can only marry a Christian woman if she is chaste and does not commit shirk. Although the latter is a minority view, there are many evidences to back it up. Sadly, Muslim men are quick to jump into a marriage with a non-Muslim woman and ignore the rules and stipulations. A Muslim man cannot marry just any Christian or Jewish woman. The woman must be chaste. Not women who have boyfriends and commit fornication. Think things through logically, is marrying a non Muslim a wise decision? As Muslims we know this life is temporary, wouldn't it much easier to marry someone who will support you in your deen? Someone you can pray with and have a strong Islamic family with. Brother, many people confuse lust with love, it's shaitan's way of beautifying sin. You cannot convert the woman, nobody can. Guidance comes from Allah alone. Do not marry someone with the intention of changing them, you may end up in misery. I would advise you to stay away from her and concentrate on your deen. Marry a pious Muslim sister instead, there are many sisters in need of practicing husbands. May Allah guide you.